So, our garden planting got delayed by about thirty minutes today because this young bull moose parked himself in the yard and proceeded to snack on willow and birch leaves. I was standing in the bed of my pickup truck while I took photos. Mostly, I just watched him strip entire branches of their leaves. 700 acres burned in a few hours. Flames were shooting 100 to 200 feet into the air. Watching a fire rage and looking at a large animal that could stomp you in an instant are both humbling experiences. I felt sad as I watched the fire (sometimes I just had to look away) because I know people who live up in the area that burned, and I felt sure that houses were being destroyed. Miraculously, no houses were lost–I’m still amazed that the fire fighters were able to keep things under control. And the moose, well, at one point he turned and looked at me and my heart did a little leap, like okay, get ready to jump down and scoot into the cab because it feels like that moose is going to come my way in a big way. But then he just kept tearing leaves from the trees. So, those were my weekend highlights. What were yours? Paul, despite all the activity of my book launch, my weekend wasn’t half as amazing as yours. From drama of the fire to the quiet joy of a visiting moose…I think I need to move to Alaska to bring some excitement into my life. That moose is such a lovely fellow! A moose is exciting enough but a serious fire too, there must be a story in that somewhere. I think you get the prize for nature’s exciting events! Sorry to hear about the fire. Attended a small local writer’s conference – no moose or fires, but it was informative and refreshing. Nothing as exciting as that. 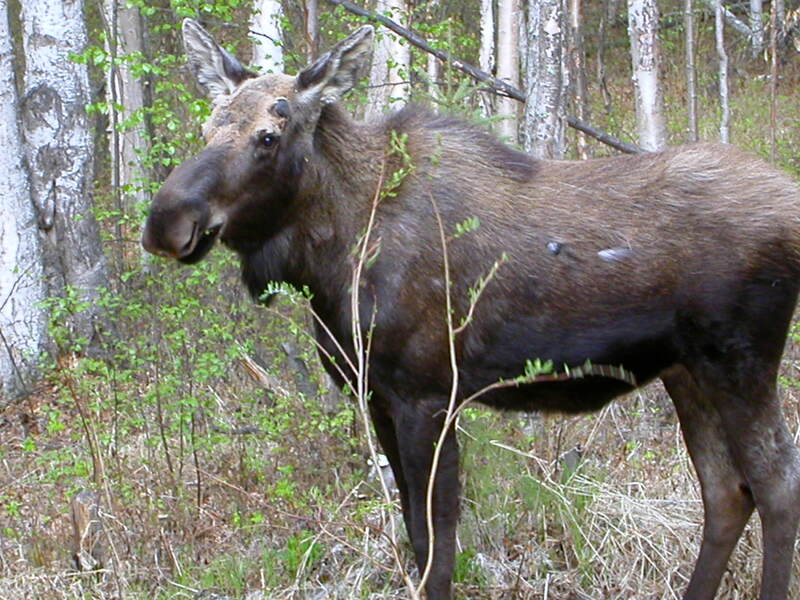 Though I did have a conversation with friend about the moose that chased me when I was running – they didn’t believe me that moose can be dangerous. But I know better. Sorry about the fire. Awesome, terrifying, and depressing all the same time, I’m sure. Laura, chased by a moose!! That’s serious stuff! I’ve never been chased but I’ve had some close encounters. And the fire was all of what you mentioned. Fire is a real active part of the natural landscape up here, but when your friend’s houses are threatened you just hope that the firefighters can direct it away from populated areas. Sorry to hear about the forest fire. I’m glad no houses were destroyed and everyone is okay. And a moose in the yard, huh? Yea, that doesn’t happen out here in PA. We’re kind of lacking on the whole nature scene, unfortunately. I both revere and fear the moose. What an incredible close encounter. The photos are stunning. I think the moose wants to be the MC in your next story. It was a totem moose coming to deliver a message. The only time I encountered a moose was in Yellowstone National Park many moons ago. 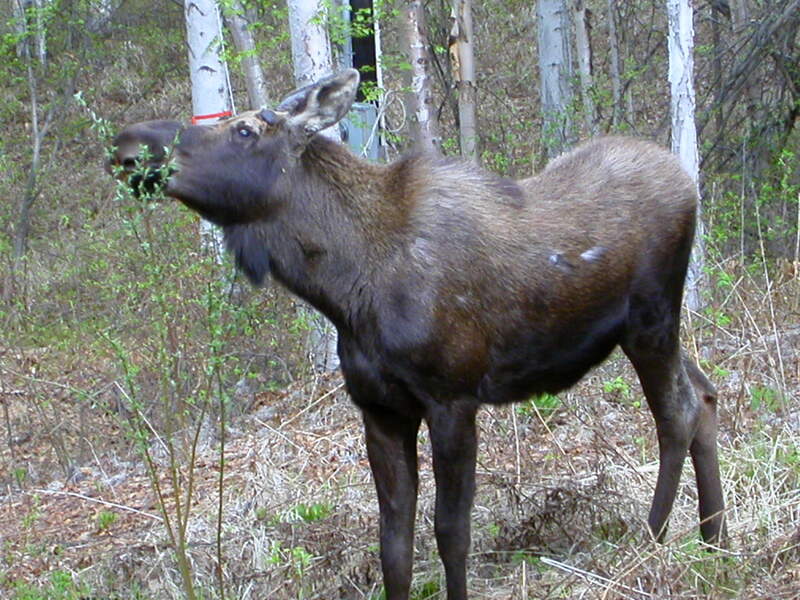 However, while trekking across the USA and parts of Canada back in the year 2003, I kept watching for moose. None came out for me to admire their beauty. Nice to have them come to you like that. Fires in the wilderness are always sad to see, but ones that are started by lightning are natures way of clearing the land for grasses and tender seedlings to sprout for food for deer and other animals. Still, they are frightening. Lucinda, thanks for stopping by. 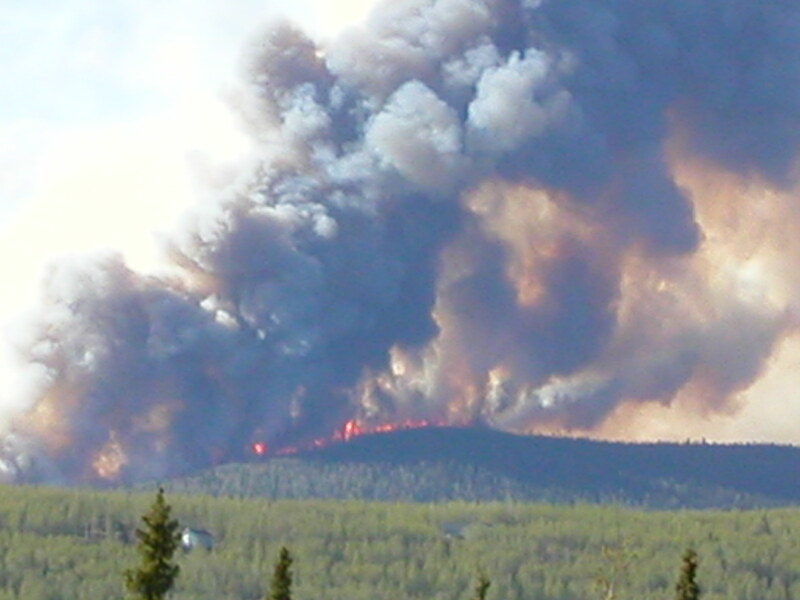 Fire is a natural and awesome part of the Alaskan ecosystem. It’s common for a few million acres to burn up each summer. I’m sorry about the fire and I’m so glad no houses were destroyed. That moose looks satisfied in the last pic. I think I already told you about the time in Yellowstone when I was hiking and a moose crashed down a hillside toward me. We both halted and stared at each other just yards apart. I was lucky and have never forgotten that heart-stopping moment. Glad to hear you’re having such an exciting homecoming and that nothing bad came of it! Wow! No highlights at all here– you live a much more exciting life than I do! wow. nature never disappoints. thanks for sharing! Glad no structures are burned down. In SoCal, some structures do get burned down. Fires are so common in California it reached the point where I’m not even worried if even if it’s less than 10 miles away. If it’s about 500 yards away, then it’s time to panic and star packing. It’s one of those scary moments you’ll ever experience, especially when you can see that the fire is coming so close to you. Seeing the fire coming down the hill, which was less than 500 yards away from you. Everyone was in a panic trying to retrieve as much belongings as they can. Still, you’ll know what’s important to a person by the things they retrieve. My mother brought her uniforms and rollers but forgot her regular clothes. My brother lifted the clean clothes still in the hamper and brought all his PS2 with games. I’m already packed (thank goodness I got lazy putting my clothes back) but managed to retrieve all the library books. I would love to live in Alaska! The pictures you post are breathtaking! There’s something about fire that fascinates me. Always has. My weekend was SO BUSY. I had like 3 appointments or events, and was gone all day Saturday. Ugh. I need a weekend for my non-weekend.